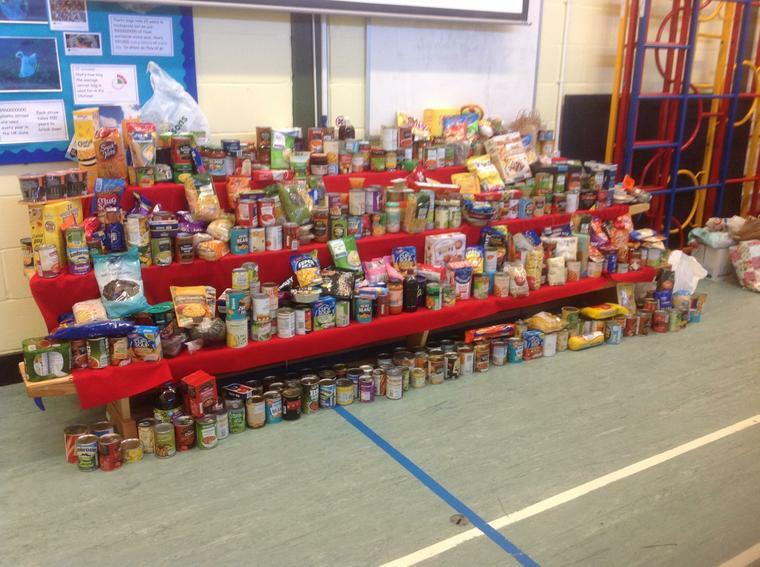 This afternoon we celebrated Harvest Festival with two wonderful assemblies in the hall; but before we tell you about that, we'd like to say a HUGE thank you for all your generous donations of food that you have sent in to school over the last few days. They certainly made a very impressive display at the front of the hall. Our first assembly began with all the children in Years 1,2 and 3 singing Thank You Lord. and then a number of children in Year 2 read their lovely Harvest and Autumn acrostics. Next up, Year 3 presented some amazing Autumn landscapes inspired by Seurat and Monet. They also read some beautiful poems that they had written. We then sang a rousing version of Oats and Beans and Barley grow complete with actions. The children had a lovely time teaching the moves to all the adults in the hall. Finally the children in Year 1 helped Mr. Cooper explain why this year we had collected for the Cromer and District Food Bank. The children then filed quietly out of the hall listening to 'Harvest For The World' by The Isley Brothers and thinking about the issues that we had raised during the assembly. A short break and then it was the children in Years 4, 5 and 6's turn. We again started by singing Thank You Lord which was followed by a number of children in Year 4 singing a Harvest themed version of George Ezra's 'Shotgun' led by Miss Murray. It was fantastic! We then all sang a version of Harvest Home by Big Country which was followed by Year 5 who sang a very catchy song about beans. Thanks Miss Savage, I have a feeling we'll be singing that for the foreseeable future. We then heard from our guest, Tim, from the Cromer and District Food Bank who explained how our donations will help people in crisis in the local area. Year 6 finished our second assembly with some very informative and thought provoking poems about rationing of food during and after the WW2 and the importance of not wasting food.